The American Legislative Exchange Council (ALEC) recently released the 10th edition of its Rich States, Poor States report. Its analysis uses two measures to rate each state. “Outlook” scores rate states according to how well their policies conform to the authors’ view of good economic policy. “Performance” scores are based on the state’s historical economic scores. The percentage growth in the State Gross Domestic Product between 2005 and 2015, on which Wisconsin ranks 29th. The Absolute Domestic Migration, the net number of people moving between Wisconsin and other states, on which Wisconsin ranks 39th. The percentage growth in non-farm payroll employment between 2005 and 2015, on which Wisconsin ranks 37th. The underlying assumption is that a state that adopts policies leading to a higher Outlook score can expect a better Performance score in future years. When it comes to calculating Outlook scores, Rich States, Poor States is enthusiastically pro-inequality. This is reflected in the variables used to calculate its Outlook rating. Wisconsin is upgraded for its lack of an estate tax and of a state minimum wage law, as well as for having a “Right to work” law aimed at undermining unions. The more regressive the personal income tax the better the score (Wisconsin is rated 17th —moderately progressive). The highest rated states have no income tax or, in one case, a regressive income tax. Wisconsin gets downgraded for its relatively high top personal and corporate tax rates. The three authors have long been active in conservative circles. Arthur Laffer, the lead author, is most well-known for the so-called Laffer curve that purported to show that reducing tax rates stimulated so much extra economic activity that government revenues would rise, allowing tax cuts to pay for themselves. Most economists, including conservatives, have concluded this theory is unsupported by evidence. Nevertheless, Laffer is considered one of the founders of supply-side economics, which still dominates conservative intellectual circles, and may influence the tax plan by President Trump and the Republican Congress. The second author is Stephen Moore, formerly a Wall Street Journal editorial writer and fan of supply-side economics. Moore is credited with founding the Club for Growth and is now with the Heritage Foundation. During the 2016 presidential campaign Donald Trump often listed him as one of his top economic advisers. After running an op-ed by Moore, the Kansas City Star editorial page editor announced that “I won’t be running anything else from Stephen Moore,” because of the substantial factual errors in it. (See this account in the Columbia Journalism Review). Buried in an otherwise-humdrum jobs report was the jaw-dropping pronouncement by the Department of Labor that mining jobs in America were up by 11,000 in March. Since the low point in October 2016, and following years of painful layoffs in the mining industry, the mining sector has added 35,000 jobs. What a turnaround. Liberals have been saying that Trump was lying to the American people when he said that he could bring coal jobs back. Well, so far, he has delivered on his promise. Coal’s comeback sounds less colossal when one realizes that Moore is talking about all mining jobs, not just those mining coal. If coal mining, representing about 8 percent of all mining jobs, gained 35,000 jobs, that would represent a 70 percent increase. For coal mining the one-month gain was 100 jobs and the gain since October is 1,000 jobs. In fact, this small uptake in coal mining jobs started six months before Trump took office and likely has nothing to do with national policy. Between 2011 and 2016, economic reforms impressively propelled Maine from 48th to where it now ranks at 38th in economic outlook in the 2016 edition of Rich States, Poor States: ALEC-Laffer State Economic Competitiveness Index. Worse still, if both the minimum wage initiative and the income tax surcharge were to pass, Maine’s outlook ranking would deteriorate from 38 to 46. As Williams notes, Maine moved up on the list of Outlook measures from 48th in 2011 to 38th in 2016. Unmentioned is the Performance score. While moving up in Outlook, in Performance it moved from 23rd in 2012 to 44th in 2016. 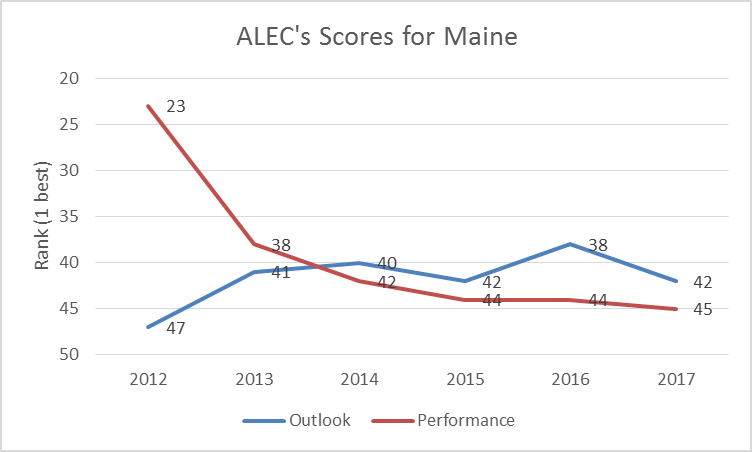 If an improved Outlook score is accompanied by a declining Performance score, it is understandable that Maine voters might be skeptical of Williams’ argument. In the end, the supposedly “anti-growth measures” passed and, as threatened, the state’s Outlook score fell to 42nd in the 2017 report. In theory, an improvement in the Outlook score should be followed by an improvement in Performance. As Maine shows, that may not happen. What about Wisconsin? 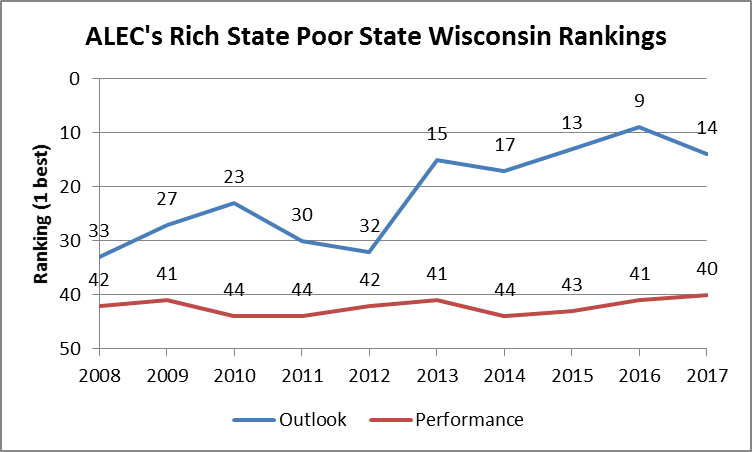 The next chart shows the history of the Wisconsin Outlook and Performance scores since 2008. The election of Scott Walker as governor triggered a jump from 32nd to 15th place in the Outlook ranking (in blue) followed by a climb to 9th over the next three years. Unfortunately Performance ranking (in red) didn’t follow. It has been stuck in the same low 40s ranks that it had under Governor Jim Doyle. One conclusion from looking at the economic data is that the Walker economy looks very much like an extension of the Doyle economy. An outsider, given the economic data, would not be able to identify when the political transition occurred. The proverbial Martian, transported to Wisconsin and given its economic data—but not election dates—and asked to identify when the gubernatorial transition took place, would pick two time periods: in early 2008 when the state’s economy started to collapse along with the national economy and a year before Walker’s inauguration when employment started to recover. Of course, neither would be correct. I would suggest that Rich States, Poor States and its authors expertly demonstrate at least two fallacies. One is the ascendance of ideological models over evidence. Once something like supply-side economics takes hold, its adherents are nearly immune to any contrary evidence. Moore’s eagerness to conclude, on very skimpy evidence, that Trump is fulfilling his promise to restore coal mining jobs is one of the better illustrations of this. Another is goal displacement, illustrated by Williams’s warning that by adopting a higher minimum wage Maine will get a lower Outlook score. Presumably the average voter in Maine was more concerned as to whether the state’s economy would improve, not whether ALEC would approve of the state’s economy. Since the Great Recession hit, by most measures the American—and Wisconsin’s—economy has steadily improved, but the benefits of this improvement have missed large portions of the population. The policies advocated by ALEC would worsen this economic inequality. That’s really interesting. So both are failures then right? 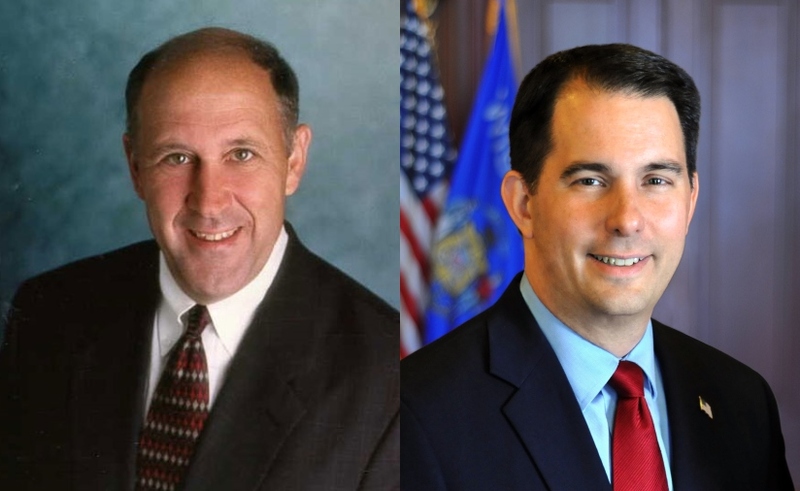 I mean conservatives incessantly bash Doyle and the state’s economic performance while he was governor, but if it’s no worse than the state’s performance under Walker, then neither is a good governor right? What I find highly amusing about the “Outlook” type of philosophies is that they are based on issues such as perception of business owners or investors. The thought is that if the state passes “X” law or “Mr. Z” is elected, then businesses will grow because the owners and investors believe the environment is now business friendly. The empirical evidence that is excellently presented by Bruce Thompson shows perception doesn’t result in any real economic growth. It appears that the bottom line for businesses seeking to grow is … the bottom line. If a state or region doesn’t have the labor resources for a business, the supply lines for a business or the market for a business, it simply won’t grow, regardless of how optimistic a business owner feels about the laws or programs. I wonder if ALEC has also influenced the naming of repub. newborns – boys and girls – since they began working to control our lives. The rebuttal from The Federalist is spot-on. Lefties can’t handle the truth. Heck, they’ll probably delete this to prevent free-thought and alternative views. It is authored by two employees of the Wisconsin Institute for Law and Liberty. Unfortunately it offers no information that would cause me to alter my conclusions. They largely follow the Walker strategy of taking credit for improvements in the Wisconsin economy that track the ongoing recovery from the Great Recession.